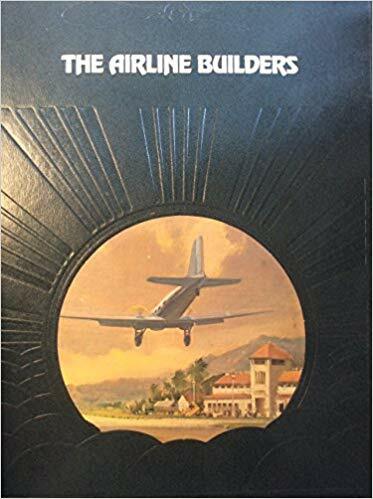 In 1937 the well known first licensed pilot of America, Walter Brookins, introduced our inventor David Davis to Reuben Fleet, the founder/owner of the Consolidated Aircraft Corporation in San Diego, California. 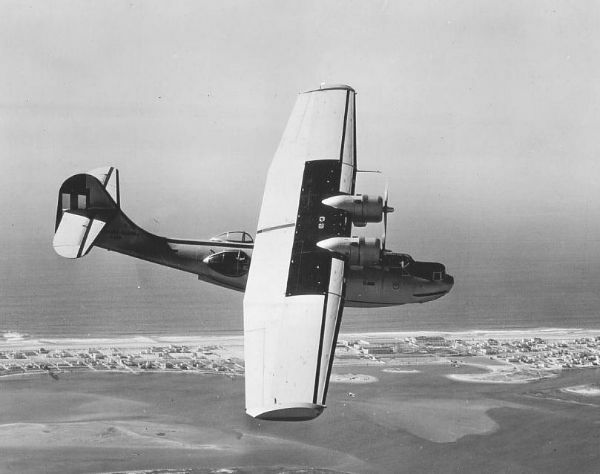 Consolidated was a well established manufacturer of long range flying boats for the American Navy, such as the PBY-Catalina and PB2Y-Coronado. The engineering department under Isaac ‘Mac’ Laddon was working at that time on a successor for the Catalina, which would be called (until the intended procurement by the Navy), the Model 31 Corregidor. There were also negotiations going on regarding production licenses for the Boeing B-17, the heavy four-engined Army Air Corps bomber. Enter Davis, introduced by Brookins to the top of the firm as a technical wizard with special interest in long range flight. For the last several years he had been working on wing design, with special attention to the cross sectional shapes of wings. 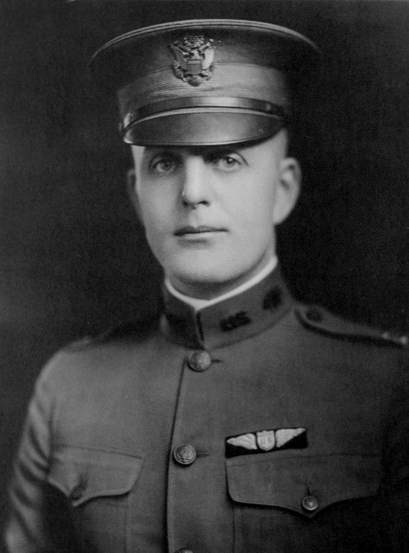 He claimed to have developed better wings than NACA, the official federal aviation research authority. To prove it he presented his hosts with his Patent 1,942,688 “FLUID FOIL” of Jan.9.1934. 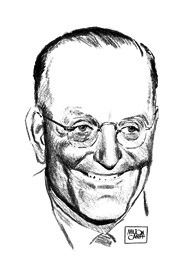 The Consolidated executives received their guests politely and, after the introduction, proceeded to look somewhat bewildered at the presented patent. It showed numerous unwieldy pairs of formulas apparently describing the form of the upper surface of a wing section (suction side) and of the under surface of the same wing section (pressure side). It should be noted that the formulas contained multiple appearances of two parameters, A and B, whose actual values were left unspecified. Written in this way, the paired formulas did not describe a single wing section, but a whole family of sections. 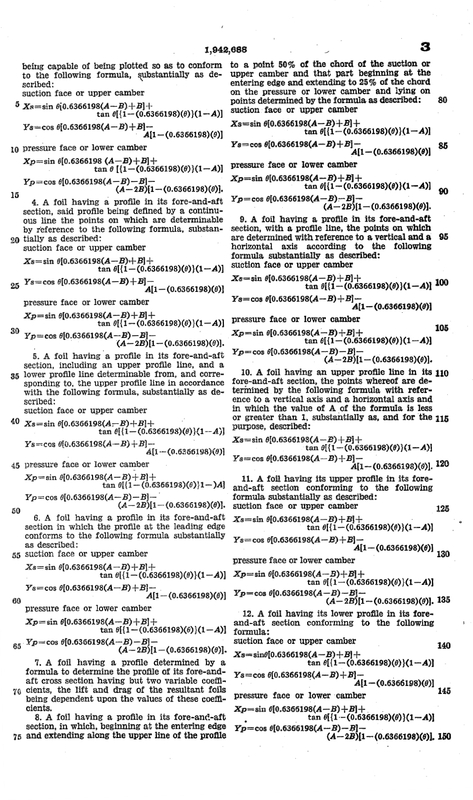 On page 2 of the patent a single example of calculation was given, where A had received the value: A=0.717257 and B=0.208228. 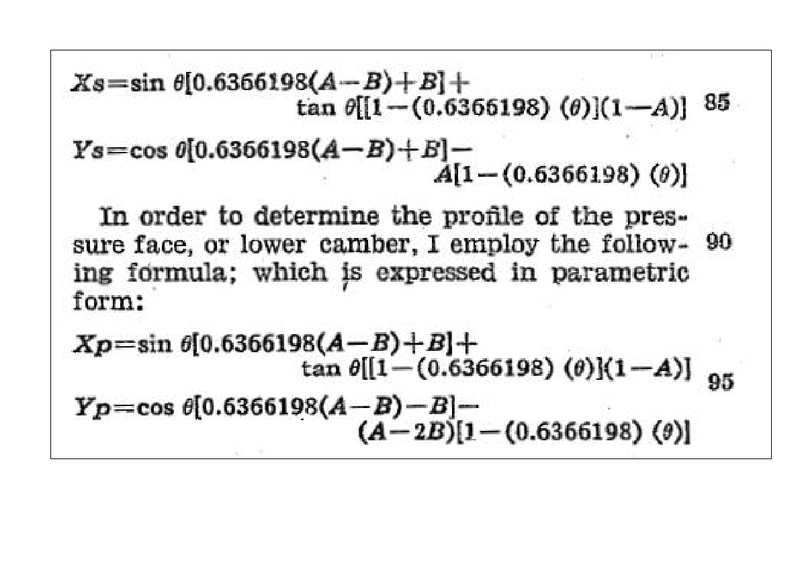 When these values were substituted in the formulas a smooth looking wing shape resulted as shown in Fig.1 on page 0 of the patent and reproduced here at the top of this article. Page 3 of the patent (see picture below) left the technical staff of Consolidated even more bewildered. Laddon: Where on earth did you find these formulae? Davis: I derived them from theory. Davis: Yes, hydrodynamic, the Magnus force on a rotor moving in an air stream. But the derivation is not part of the patent. They then had a long discussion about the required values for the A and B parameters. The Davis’ patent stated that A influenced the lift force delivered by the wing at a certain angle of attack and B the fluid resistance (drag). Consolidated required, for long range cruise flight, as low an air drag as possible at a relatively high angle of attack. What values of A and B would be best? Davis promised to disclose the desired parameters if Consolidated agreed to use his wing section for actual production aircraft and pay him a certain royalty per airplane sold. I am not informed how much time these discussions took, but the evidence is there that the negotiations were intense. Davis must have mentioned that he could show certain results from model experiments. However, I am not sure he told the other party how he had been able to obtain these test results. 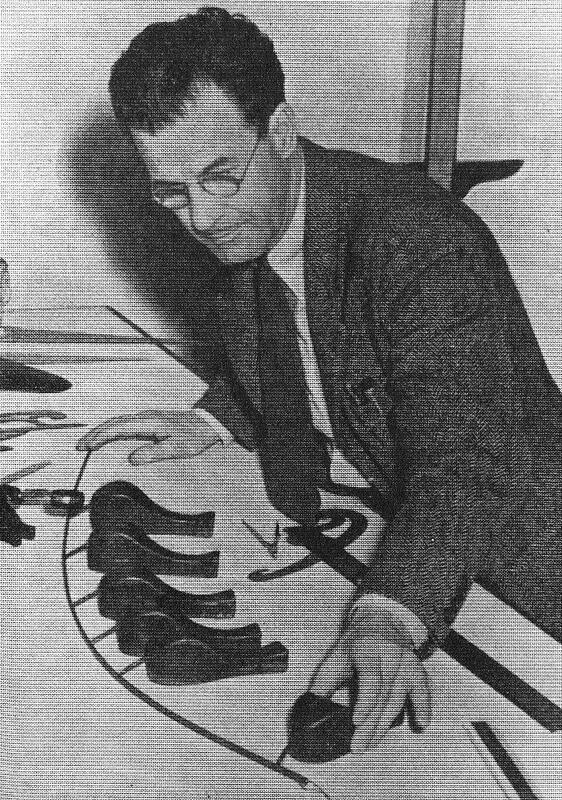 To settle the uncertainties, the two parties decided to send one model of a Davis airfoil in addition to a standard NACA model of Consolidated’s choice to the so-called ’10 foot wind tunnel’ of the Guggenheim Aeronautical Lab at Caltech in Pasadena to let an unbiased party make the comparison. 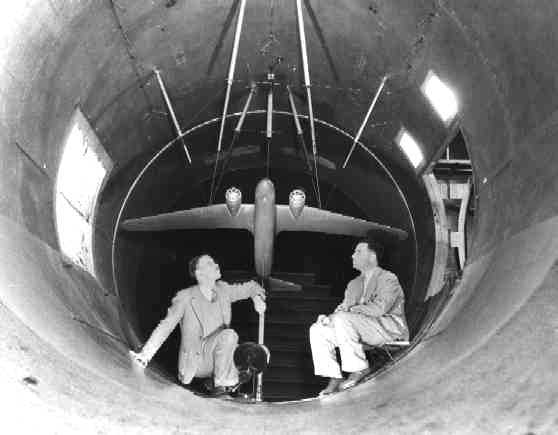 Both wind tunnel models were for a wing of the same planform en depth. Davis personally fabricated his sample to a high degree of surface perfection (with shape parameters A=1 and B=-1). The Consolidated entry followed the standard specs for a NACA 21-series wing section. The test results confounded GALCIT professor Clark Milligan to a high degree. The Davis section showed very low friction even at high angles of attack. Even after re-finishing Consolidated’s NACA model to the same surface specs, the Davis section turned out to be superior. A total of three trials gave near identical results. Everybody finally agreed that the Davis design was not a bad choice at all. The engineers caught the spirit of things and said: why not use it for the wing of the Corrigedor that we are building now? So they did and although the big boat looked according to some like a ‘pregnant guppy’ it flew like a lark (see my previous blog on this subject). Meanwhile, Major Fleet communicated with his network at the Air Corps and he got the approval to build a prototype heavy bomber with the new wing. The wing was amazingly slender and prolonged long distance flying by some 10% and saved fuel on regular runs to an equal amount. 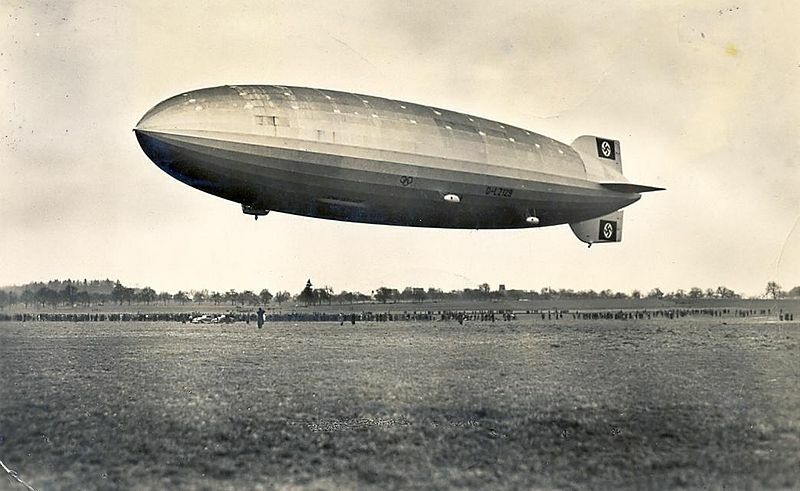 The prototype was designed and built in nine months and flew one day before the contract stipulated, on December 29, 1939. 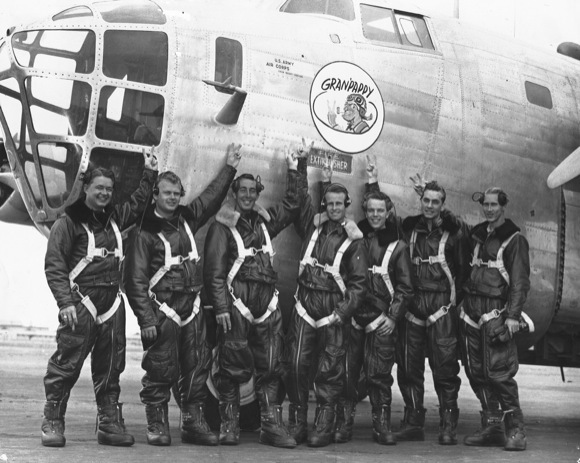 B-24 Liberator: Crew before first test flight December 29 1939. 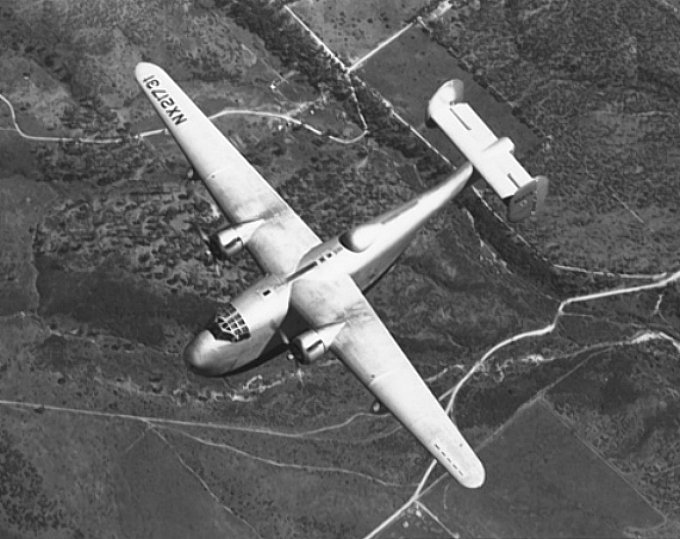 The B-24 Liberator and its many variants turned out to be a big success for Consolidated Aircraft and for David R. Davis. According to Wiki a total of 18,500 were constructed. Their war record in Europe and in the Pacific theater was most impressive. David Davis received his royalties, but his name was never mentioned, not by Galcit, not by academia in general, except for Dr. Vincenti, who wrote the very well researched definitive account on which this blog is based. NACA did not waste time in developing its own competing wing profile that was used in the North American P-51 long distance fighter. I must now finish my private history of the Davis wing before my memory gives out completely. Tantalizing about this wing was the fact that before the year 2000 so little was published about its remarkable airfoil (wing cross section) in the official annals of American aviation history. How was its form discovered? Who was Mr. Davis? What was so special about it? 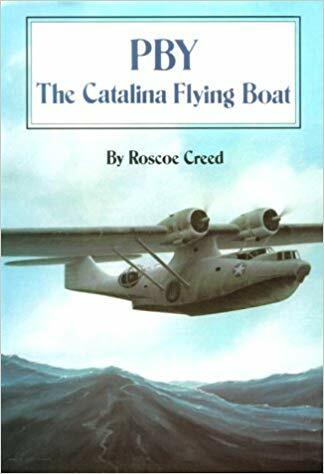 In the Creed book of 1985 about the Consolidated Catalina  that I refer to elsewhere on my site, the wing was briefly mentioned in one paragraph as being used on a special 1939 Consolidated flying boat (the Model 31 Corrigedor) and on the upcoming B-24 Liberator bomber. But how did this revolutionary design pop up in the practice of airplane design of that period? Why was everybody, including NACA, so silent about it? Why was there no readily available publication? Why did Mr. Davis not get offered a professorship at Caltech? 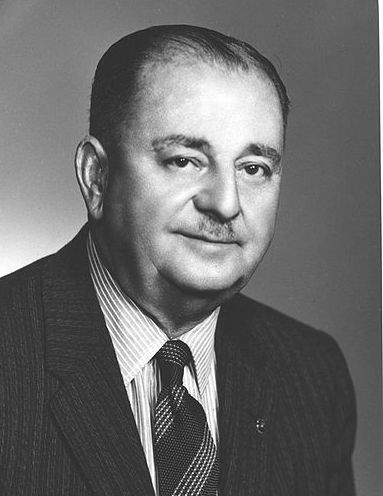 “Walter C. Vincenti: “What Engineers Know and How They Know It”. To me this was astounding: Google had not just found a character-by-character match with my search argument, but had found this match within a book with a non-corresponding title! From that day on my admiration for Google (and its many amazing products) has only increased. A short time later I managed to obtain the very book, second hand, via the Crawford & Peters book store in San Diego that my Canadian friend John Gallipeau had located for me and within weeks I was reading chapter 2, page 22 to 33. The author, Walter Vincenti, is an aeronautical engineer but talks the philosopher’s lingo, using words like ‘epistemology’ and ‘presumptive anomaly’. I for me would have liked a more straight account and maybe some attention to the creativity and the personal flair of the engineers-in-charge at the early stages of the design process, but the story of how the Davis wing came to be used in the Second World War with 18,450(!) B-24 Liberator bombers and transport planes is all there. 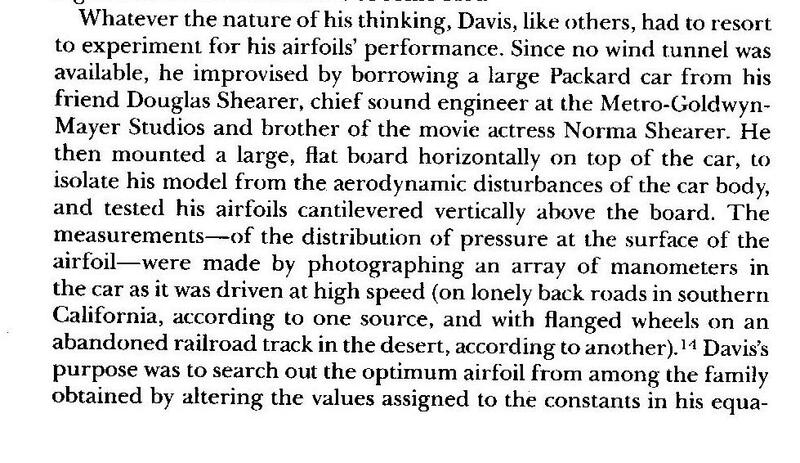 This meant that Davis was in fact constructing an airfoil with a very slowly changing curvature at the leading edge, resulting in a profile with a very thick center: a so-called laminar flow profile. In his patent he gave a formula for the exact shape of the section, based on the shape of a cycloid, that is the path that a point on your tire tread describes in space as your car travels down the road. Davis would not explain how he derived the formula, indeed certain coefficients were in doubt until the very end. Dr. Vincenti explains that David Davis had been searching for a wing design which presented relative low air friction (drag) at high cruising speed. At cruising speed the engines would be kept at a low power setting in order to save on gas consumption. The total drag of the airplane needed therefore to be low. This meant that the wing, while delivering sufficient lift, should present minimum drag. The drag of a wing in flight has two parts: the induced drag that is generated by the lifting action of the wing as it moves through the air and the profile drag which is the resistance force that is felt by any frontal surface that is facing an air stream. I had thought previously that the wing had to be thin in order to have a low profile drag, but Davis reasoned differently. He argued that a teardrop shape gives mimimal profile drag: a shape with a relatively blunt nose, a curvature getting thickest toward the middle of the wing and then relatively straight flanks toward the pointed trailing edge. It resembles in fact the elongated tear drop shape of a zeppelin. In addition, a wing cross-section shaped like this has an important advantage to the structural designer: it can accommodate two hefty front and rear wing spars that are needed to carry a wing with a large span. The larger the span, the lower the induced drag will be, but the higher the bending moments at the root of the wing , so the wing will need a strong internal supporting structure. A deep wing would provide a nice roomy central space between the spars to house the fuel tanks and the retracted wheels of the airplane. To a technical person who is inclined to listen to rational explanations and to believe their conclusions, the rhetoric of certain present day political leaders can be baffling. Even more baffling is the eager positive response to such demagoguery by a large part of the population. The danger of what may happen next – rhetoric translated into loathsome policy – is frightening. The lead up to the Second World War has shown us how clever manipulation of the minds of people who are relentlessly targeted by propaganda, will in the end lead to these people applauding anything that is promoted by the voice on their radio. Apparently – and this may be an unexpected conclusion to us, technical people – it is possible to influence the minds of good willing blokes and girls alike in any way that a politician wishes, given enough money and assistance from experts who know social psychology and modern techniques of communication. In this way a regime with a particular agenda may change the moral conduct of its population. Norms that were for a long time based on religious freedom and universal human rights may be replaced by hard rules like: ‘own-people-first’. War may be declared on other nations, making void all habits of polite co-existence. The own constitution may be re-explained in different terms. Racial suppression may be declared the norm. Your neighbor may be sent off to a concentration camp and nobody inquires as to how and why. 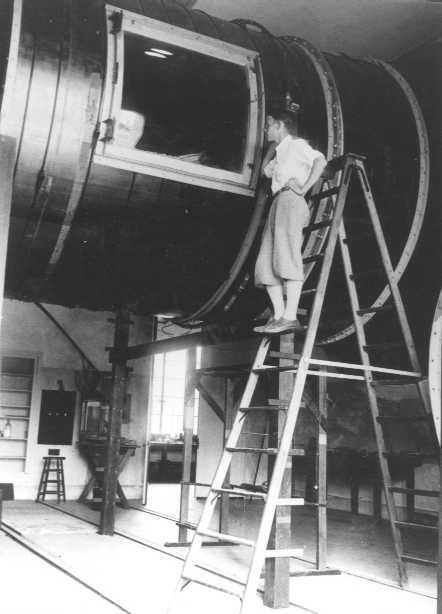 To limit ourselves to the subject of this blog: early aviation history, here are some examples of frightening changes of moral judgment. In 1940 the ruling Nazi’s and their sympathizers in Germany applauded the destruction by Luftwaffe bombardment of the city of Coventry in the UK, as a spectacular warning for an imminent invasion. Equally true, the hurt British took pride in the retaliatory actions of their RAF on the city of Berlin (and who would blame them for that?). The state of war changes all judgement of right and wrong. It is easy to find more examples. One may conclude that war erases all civilized premises of ‘having to love thy neighbor’. The new maxim becomes: ‘let them suffer what we have to suffer (and then some more please)’. The scientist/engineer/technician is told to design superior airplanes and to the Army comes the order to use them as effectively as possible. The new moral standard becomes: ‘serve thy country – try to inflict as much pain as possible to the other guy’. Or: war reverses all our moral values, once the other human being has become ‘the enemy’. And apparently this takes place without any questions asked. After a declaration of war, our moral standards change overnight. As far as so-called ‘normal’ war goes, a certain effort has been made to set standards of conduct by the so-called Rules of Geneva. Thus, military prisoners shall be treated according to certain humanitarian rules. However, there are no rules with respect to a civil population that has become directly involved in military actions (called ‘collateral damage’ in doublespeak). Indeed, have brutal acts of war, such as the otiose bombardment of Dresden by the RAF in 1945, not conclusively shown that the civil population has become the hostage or even the target of modern warfare? The superior aircraft and improved weaponry produced for each new war are enthusiastically described in technical publications and hobby blogs such as these up to today and judged purely on their technical virtues, without reference to the dehumanizing effects of war or the suffering of victims. As long as we don’t know the victims personally, we can concentrate purely on fascinating technical matters. Did the crew of ‘Enola Gay’ lie awake afterwards or did they congratulate themselves on a target well located and destroyed? Let us not forget that war is gruesome. Let us be vigilant. Human beings may behave pleasantly under pleasant conditions. There is however little persuasion or rhetoric required to re-program their partitioned minds and turn them into blind, contented wielders of destruction. Charles Lindbergh in his “Autobiography of Values” Harcourt Brace Jovanovich: New York, 1978, 473 p. ISBN 0-15-110202-3. 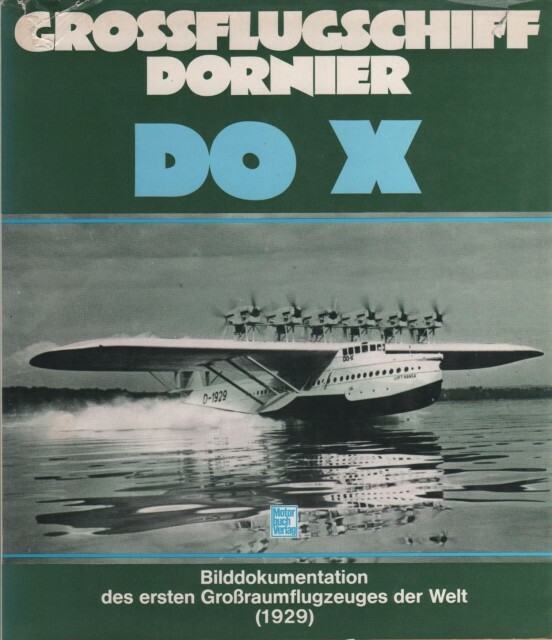 THE BIGGEST AIRPLANE IN THE WORLD, the Do X, has recently been completed in the halls of Dornier in Friedrichshafen and will make soon its first test flight. This immense aeroplane has a length of almost forty meters; the span of its wings comes to 48 meters and its height is 8.5 meters. The giant will be propelled by no less than 12 large Siemens Jupiter engines with a total power of 6200 hp. The fuel tanks are in the bottom of the airplane reducing the danger of fire almost completely. The number of passengers that can be transported is astounding: no less than 100! There is a crew of twenty needed to control the airplane and serve the passengers. The creator of this enormous colossus, Ir. Dornier, has stated that three or four of the engines may be stopped during flight without problems. However, the crossing of the ocean is not yet possible with this giant – it is not more than a step forward on the difficult road to trans-oceanic air traffic. On the photograph the immense monoplane is shown in the assembly hall of the Dornier factory. a simple non-stop jump across the Atlantic. 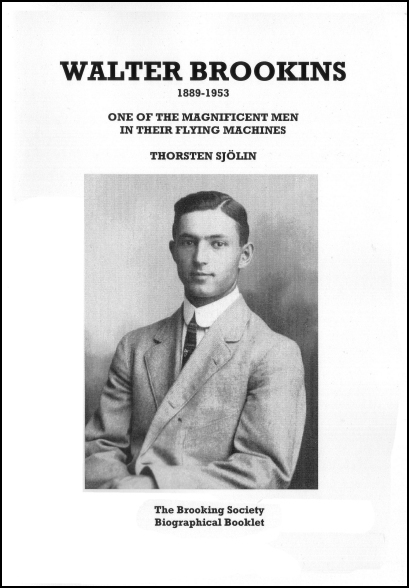 I wondered why this would be so and started to read (+ collect) books about 1930-flying boats and airliners. What were the factors that determined their long-range performance? How fascinating that era was! Next I got into a correspondence with a certain Don Middleton, a British aviation journalist, who had stated in an English monthly that the amazing long range of the Consolidated Catalina patrol boat was due to its ‘Davis-wing’. Based on general data from Jane’s ‘Fighting Aircraft of WWII’ edition I undertook to compare four contemporary transport planes: the Douglas DC-3 and DC-4, and the Consolidated Catalina and B-24 Liberator, and proved to him that Catalina’s extreme performance was based on two factors: its light construction (empty weight approximately 50% of take-off weight) and its slow cruising speed, which was right at the optimal economic flight point (maximum CL/CD ratio). The other three planes, for commercial or operational reasons, all cruised faster than their most economic speed and as a consequence had a comparatively shorter range. The Cats were slow, real slow, to the exasperation of their crews. However, slowness could also be advantageous: they were able to shield the ships they were escorting by circling tightly around them, outmaneuvering in this way attacking German and Japanese aircraft that were much faster. The PBY Catalina had no Davis-wing and I think I proved it, but Middleton never entered into a serious discussion and suggested I submit my paper to the Royal Aeronautical Society, which of course was a bit much. 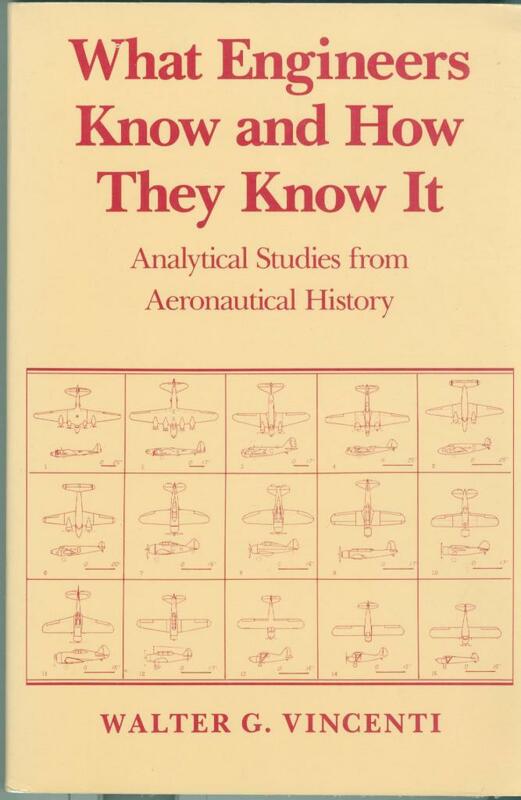 Later on I learned he disliked smart asses like me who argued from theory: he had been a skilled aircraft worker at de Havillands himself and a RAF engineer during the war. 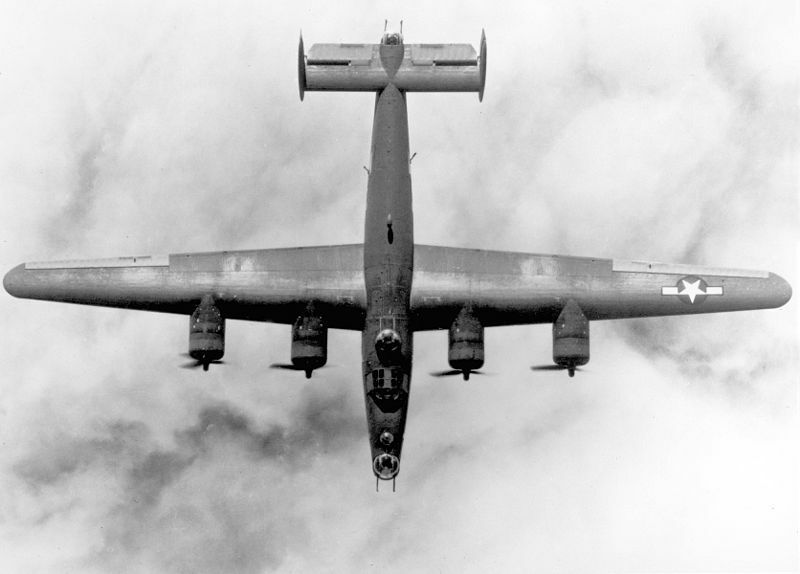 Of course the Davis-wing was used on the B-24 Liberator. Next blogs will summarize what I know about it. The inventor, David R. Davis,  appeals to me because he was obviously a maverick: he worked outside the official circuits of Universities and NACA. Apparently he had a mind of his own. As a result however, descriptions of his work are hard to find in official literature (like Abbott & Doenhoff; maybe Durand mentions him?). Apparently his wing had extreme low drag at small angles of attack (laminar flow? ), which is remarkable, because long range (like Catalina’s) is usually associated with low engine power and therefore relative large angles of attack. So there were things here which were not quite clear to me. I wanted to know more about the wing profile: it must have been very thin with maximum depth near the middle of the chord. How can thin wings be made strong enough for long spans? This was the state of my comprehension (and confusion) until I found more information. A word of warning: there have been other aviators of fame with the name Davis. 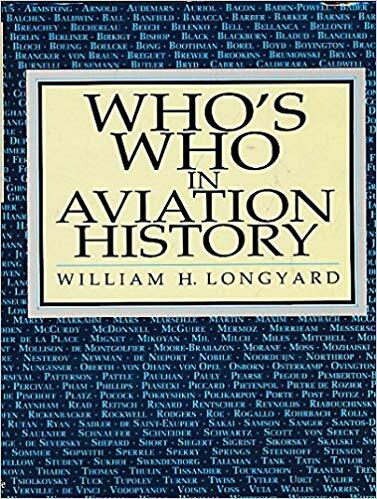 So is our man not to be confused with the unfortunate pilot Noel Guy Davis, who crashed short after take-off for a trans-Atlantic flight in 1927, aboard a Keystone Pathfinder (N-X179) airplane called American Legion. picture: PBY5 Catalina; credit: Wiki. In the 1930’s the above traffic situation occurred frequently in the canals of Amsterdam: the Fokker Aircraft factory was located in Amsterdam North, a residential and industrial section of town without an airfield, while Schiphol Airport was to the south of the city, on the bottom of a reclaimed lake. For flight tests newly built Fokkers had to be transported through the wondrous and winding canals of the old city. Sometimes, after heavy rainfall, Schiphol was too marshy and flight tests had to be relocated to Welschap, near Eindhoven, a distance of 70 miles or so to the south. Erich Schatzki loved the new country that he had settled in for a short interval of time. Relentlessly moved on by the unfolding of history, events took him eventually to the United States and then to Israel and back again to the USA – like a pendulum, going multiple times back and forth.